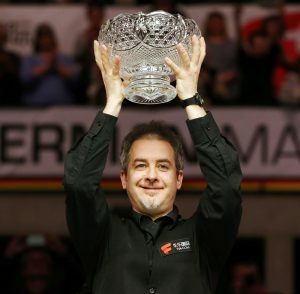 And so finally, at the age of forty-six, Anthony Hamilton secures his first ranking title, The German Masters. A hard fought 9-6 win over Ali Carter, made Hamilton the oldest winner of a ranking event since Doug Mountjoy in 1989. Coming from a 5-2 deficit, Hamilton produced his best snooker to take an 8-5 lead. Then the questions started to be asked. Would the Nottingham cueman have the mental strength to get over the line… Or would the ghosts of failures past hold sway and prevent him thinking and playing freely? When the pressures on and a big title is on the line, there are two main options. One is to not want it so desperatley…which is easier said than done when you crave a ranking title. Not wanting it, allows you to relax and play as if it’s just another game. But you either have to have won everything…or be at the point in your career when you have given up winning anything…to experience that freedom. You can’t get distracted by the consequences of winning. Or losing. Only the how to win. And that is always found in your the simplicity of your process….the what you do, and your trust and ability to do it, when you most need to. Once you get into a state of heightened concentration, triggered by the game importance, then you don’t feel pressure at all. You are so in the moment that your game flows and almost happens by itself. With the German Masters on the line, Anthony Hamilton found something in himself, that he may never even knew that he had. Yet it may have been within him all his career! He just didn’t know how to let it free. Until one heady February evening in Berlin!